Jo & Billy planned their big day all the way from Dubai and chose Dine At The Mansion to host their colourful, retro inspired wedding celebration in Yorkshire. 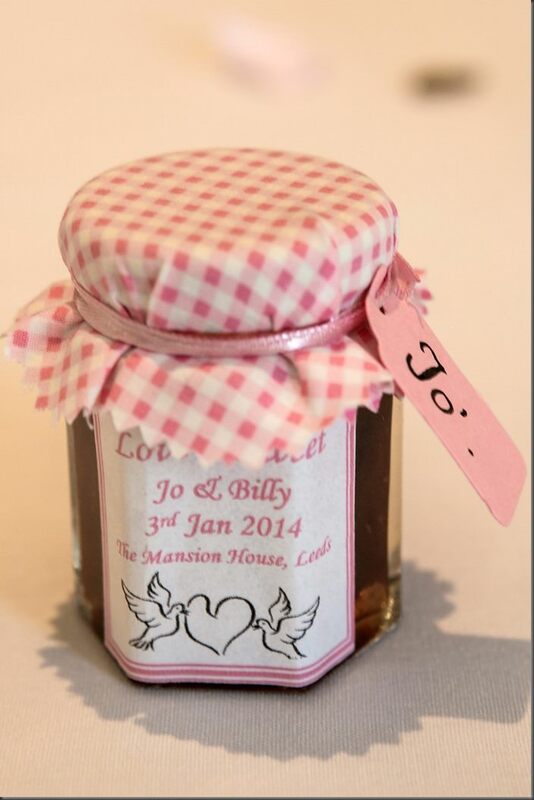 Jo says: We got engaged on Valentine’s day last year, although my husband hadn’t exactly planned in that way! He had bought the ring in the new year and had hidden it waiting for an opportunity to propose and was planning to take me away a few weeks later to do it. Unfortunately I got too impatient and gave him a bit of stick (in true female fashion) so he had to bring it forward! 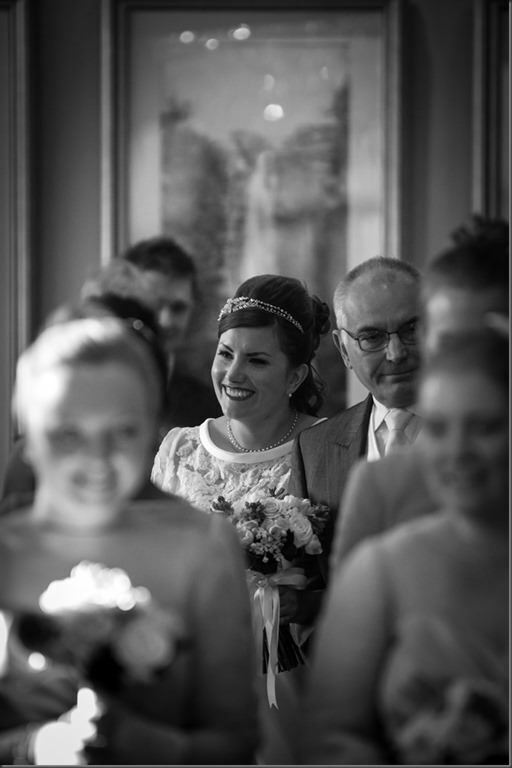 We looked at a number of venues around Yorkshire as I was born and brought up in Wakefield and around the East Midlands as my husband is from Lincolnshire. The Mansion was the only venue we looked at where we were guaranteed that we would be the only couple getting married that day, meaning that we would have full access to the venue and the staff would be completely focused to our and our guests’ needs. We loved the architecture of the venue as well as the sympathetic mix of original and modern features inside, and of course the huge chandelier over the staircase was a huge plus point! We also liked that we had access to Roundhay Park for photographs too. 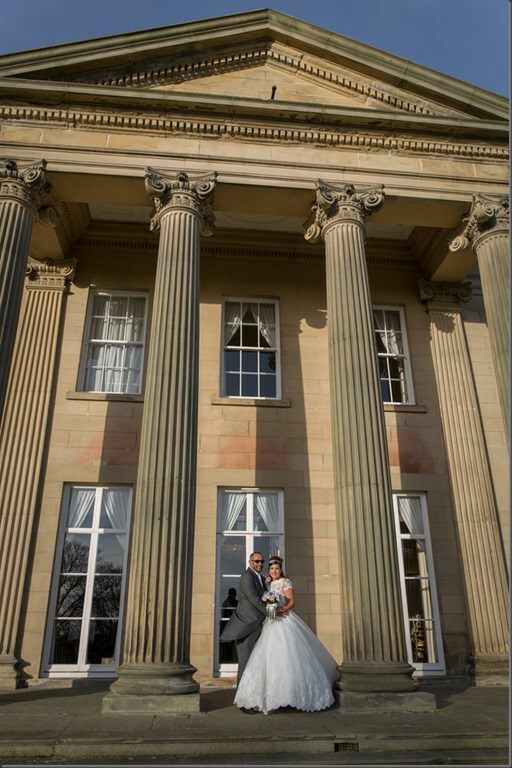 I would absolutely recommend The Mansion to another bride & groom! If I could do it all over again I would and I wouldn’t change a thing; it was perfect from beginning to end. The venue was beautiful, the staff were friendly, polite and professional and everyone had an amazing time. 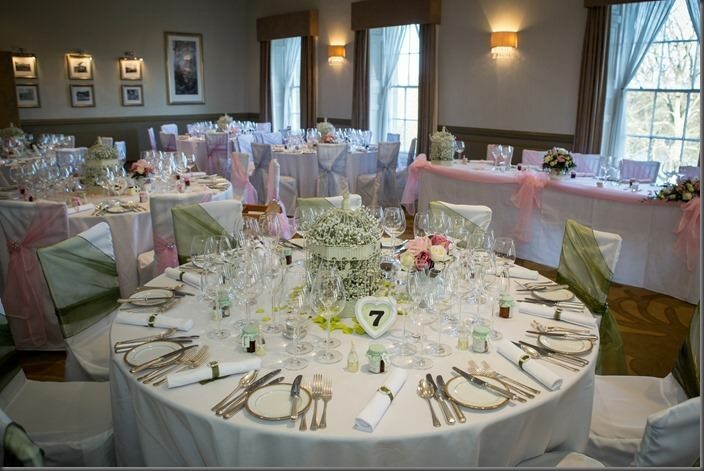 We chose Dine to event manage and cater our wedding breakfast because of the well sourced good quality of the food. Having eaten in the Garden Room restaurant on a number of occasions we knew what we were expecting and the chef was able to cater to a number of dietary requirements with the same high quality. We wanted to keep the food quite simple and traditional. We chose the Smoked Haddock Fish Cakes to start with Lemon Salt Roasted Chicken for main course. Vegetarians were also well catered for with a veggie Toad In The Hole after a starter of Creamed Wild and Chestnut Mushrooms; the chef went the extra mile too creating a suitable menu for our guests who adhered to a strict Hindu vegetarian diet with a delicious Tomato Soup and Mushroom Risotto. For desert we all ate the Crème Brulee with the chef again creating a special gluten free version for my mum. As my husband and I were in Dubai and unable to travel home before the wedding, we sent my parents to our tasting and they were ably assisted by the team in choosing suitable wines to accompany the meal, settling on an Italian Pinot Grigio and Chilean Merlot. We eventually settled on a 1950’s vintage theme as I found the bridesmaid dresses in a bridal magazine and fell in love with the style and colours. We basically built the whole theme and colour scheme around them. 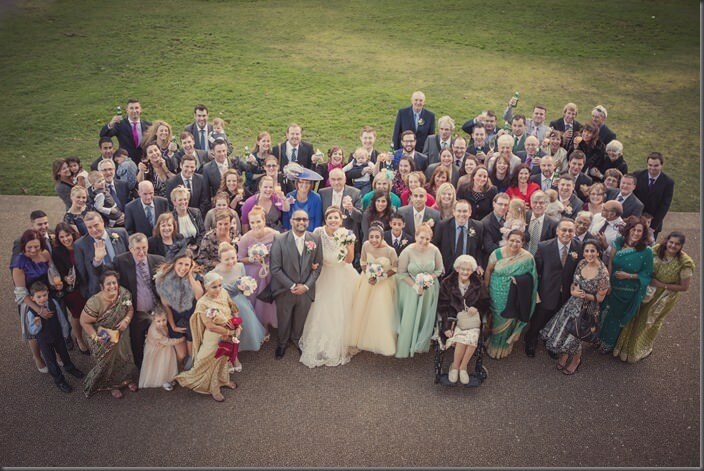 We went for pastel colours, with our bridesmaids in sage, lilac, lemon and baby blue and the grooms men in pale pink. 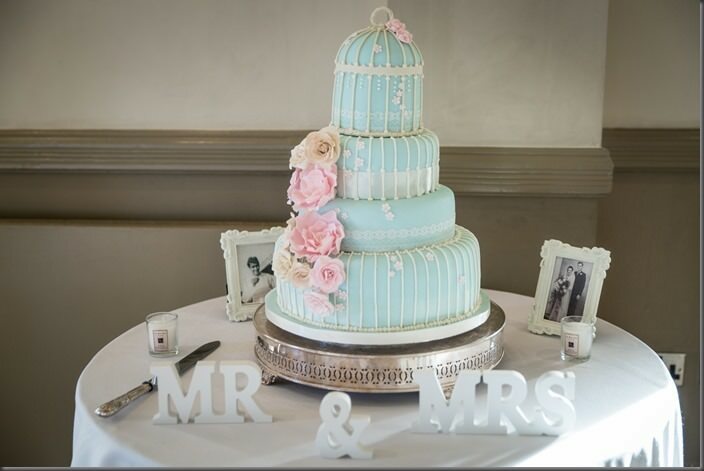 We loved the idea of incorporating a number of colours in to the wedding rather than just one or two and these colours worked well with our vintage theme. The bridesmaids and I all wore 1950’s themed dresses. My bridesmaids dresses were prom style with a sheer mesh panel on the arms and shoulders and a sweetheart neckline. I chose a full skirted 1950s dress with a sweetheart neckline and lace overlay by Nikki Flynn. 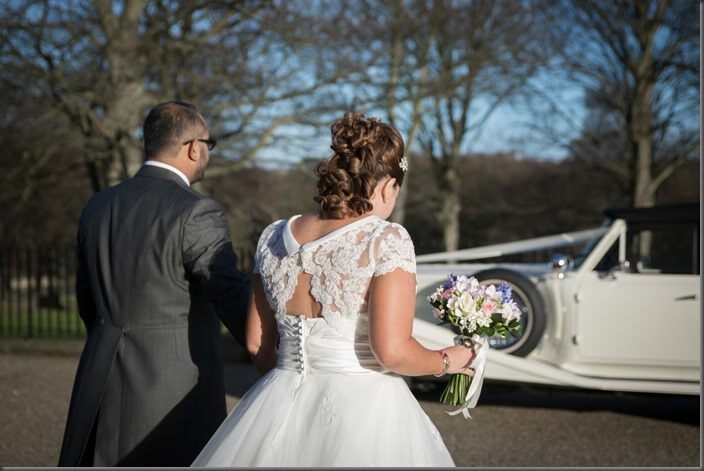 All of the dresses were bought from La Fleur Bridal in Huddersfield. In my bouquet I carried a mix of greenery, tea roses in pinks, purples and yellow and also freesia in blues, purples, pinks and yellows. I was keen to use freesia in my bouquet as my mum had them in her bouquet when she got married. 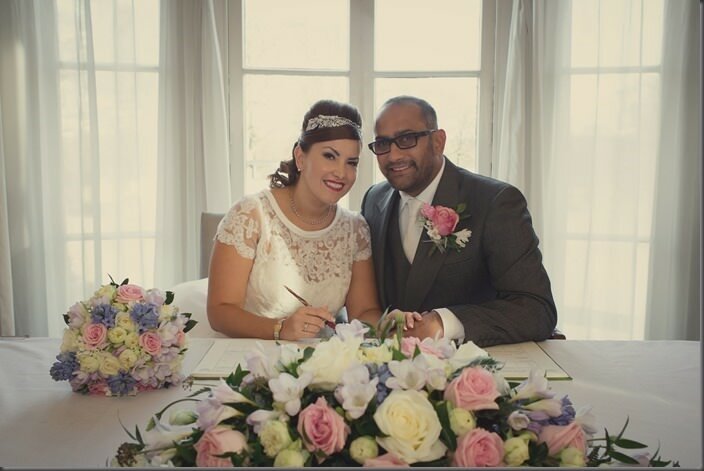 We used Alisa Devlin at Le Fleur Bridal in Huddersfield for all of the bouquets and for the main table display. 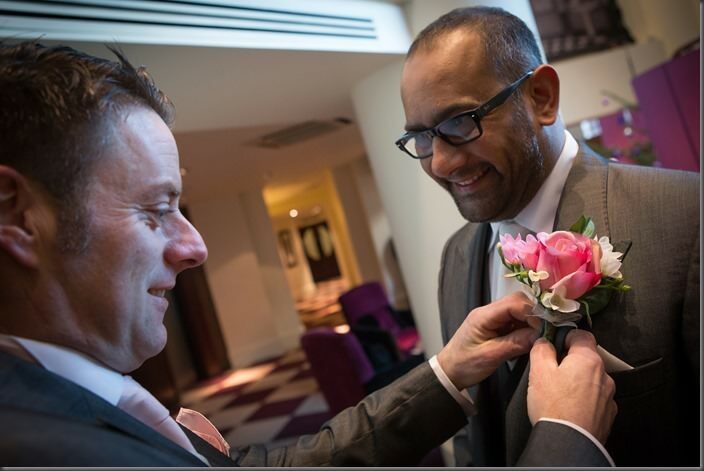 We hired grey morning suits for the groom and grooms men from The Grooms Rooms in Normanton near Wakefield. We used Lissa Alexandra Photography, based in Harrogate. Lissa is an old friend of a mutual friend of ours in Dubai and having met her a few times and seeing the quality of her work on her website we were very impressed with the way her photographs really captured the emotion of the brides and grooms she had photographed in a completely unobtrusive manner. As part of our photography package Lissa included an engagement shoot which was a fantastic idea as it got us used to how she works and gave us a preview of the sort of photographs we could expect. 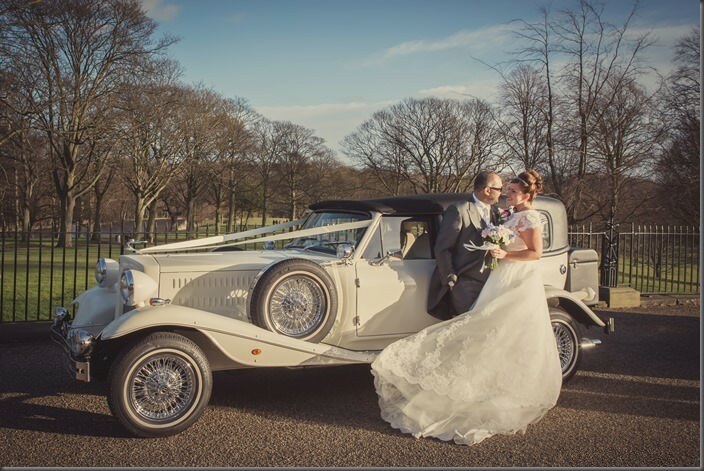 We had our shoot in the grounds of Roundhay Park and outside The Mansion in May last year which provided a nice contrast to the colours of the park during our wedding shoot in January. My favourite part of the day was walking through the doors into The Colonnades room where our wedding was held and seeing everyone’s faces. It was great to see friends I hadn’t seen in a while and of course to see Billy’s face as I walked up the aisle! We used Tahlia Borlant at Function 54 for the chair sashes, napkin rings and hurricane lamps. Tahlia is based locally and does a lot of work with the venue so she seemed a natural choice. She also has a huge stock of chair sashes in many, many colours so could accommodate my need for five different pastel colours! We also used my mum for absolutely loads of the decoration. I’m really lucky that she is really arty and it saved a fortune! She made the save the dates and wedding invitations using a bird cage theme, she made all the table decorations, the grooms button holes, the silk flower arrangements, trawled most of Yorkshire’s charity shops for vintage tea pots and cake stands, filled all of the birdcage centre pieces with gypsophila, designed the table numbers in vintage photo frames and also did the table plan on to a vintage mirror she found in a junk shop. My husband’s family are originally from India and we had an Indian blessing ceremony with our family and our friends in Dubai shortly before Christmas. We had wanted to incorporate little touches of both our weddings into the other and so we had small jars of chutney made by my mother in law, which my mum then decorated in vintage inspired checked cloth with a label with the guest’s name on. This doubled as the place setting so our guests could easily find their seats. We also mixed the after dinner chocolates with traditional Indian sweets on vintage cake stands for our guests to enjoy with their coffee. Entertainment wise, we wanted to go with a retro feel that would fit the theme and cater for all of our guests. we found a band who covered all genres from the 1960’s onwards from Manchester called the Retrosettes to provide our evening entertainment and they were fab! They played at a level which allowed the guests to still carry on their conversations at the tables and got everyone up for a boogie. They were absolutely fantastic, polite and professional we both thought they made a wonderful finale to the night. We are planning to take our honeymoon in Hong Kong, Bali, Kuala Lumpur and Phuket next month. We had a three day “minimoon” in Sri Lanka in February which was absolutely wonderful, very relaxed, with amazing food and fantastic weather. We would absolutely recommend Dine and The Mansion! We were made to feel like a prince and princess for the day, the staff were all consummate professionals and everything ran like clockwork. When we met with Senior Events Manager Craig the day before the wedding to run through everything he had all of our requirements and needs covered and had even coordinated with the chef to make sure that all of our guests’ dietary requirements were catered for. 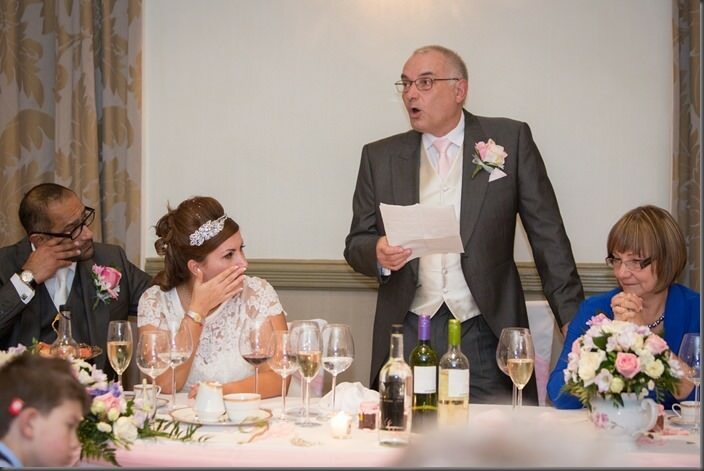 On the day he did a fantastic job of juggling 130 guests, photography and ensuring everyone finished meals on time, speeches were delivered and that all the guests enjoyed themselves. 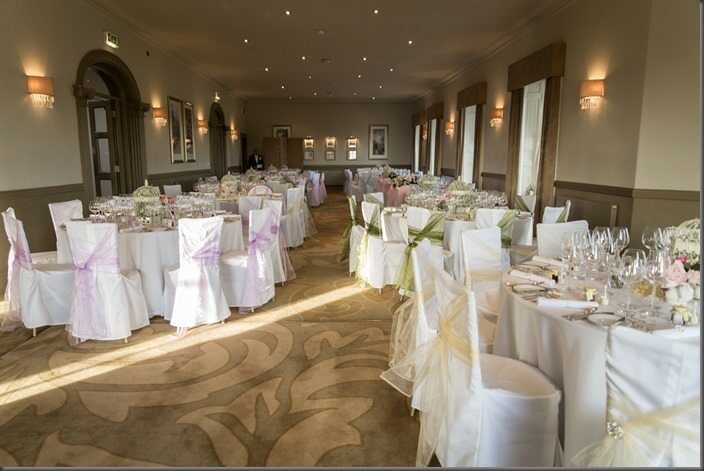 To find out more about holding your wedding or special event at our fabulous venue, contact us or visit The Mansion page on our website.